Our friends over at Alice (see the cute button on the upper right of our site?) are hosting a great giveaway that I thought I should bring to the attention of Ascending Butterfly readers. It's very much in line with our mission statement 'to seek out and provide sources of inspiration'. ah, but I digress! 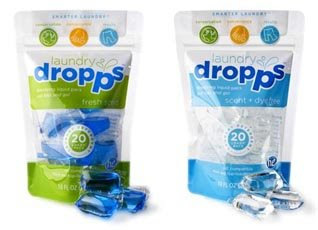 About the size of a C battery, each "dropp" contains super-concentrated detergent. In addition to being phosphate and NPE free, the unscented and dye-free version is also free of harsh enzymes. A lack of enzymes also keeps colors looking brighter longer. The pods are septic-friendly, completely biodegrade, compatible with energy-efficient washers, safe to use on delicates and easy to use. Throw one or two pods in the machine (depending on the size of the load) and your clothes will come out fresh and clean! Unfortunately I haven't yet been sent any of these to review (would love to though! ), but our Friends at Alice are having a giveaway where FIVE, yes five readers stand a shot at winning Dropps! I have already entered for my chance at winning, and hope you will do the same! First join Alice, by pressing HERE! Then come back and just press on the Graphic above of Dropps to be linked straight to the giveaway, or press HERE! I hadn't heard of this product before, thanks, I am going to look into it, and I'm going to check out Alice too. Even though Dropps are easier than carrying heavy jugs of laundry detergent, having Alice sending me everything in the mail, sounds even easier to me!